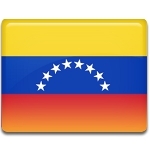 Venezuela celebrates its Independence Day on July 5. On that day the Venezuelan Declaration of Independence was adopted by a congress of Venezuelan provinces. Venezuela was the first independent state in South America. Spanish colonization of what is now Venezuela began in 1522. The first permanent settlement was founded in the present-day city of Cumaná. In 1777, Venezuela became an autonomous Captaincy General. In 1809, the Spanish American wars of independence began: Spanish colonies in South America struggled against the colonial rule. Uprisings in Venezuela were led by Francisco de Miranda who is now regarded as a forerunner of Simón Bolívar. After a series of uprisings, seven of the ten Venezuelan provinces separated from the Spanish Crown and declared their independence on July 5, 1811. Although Venezuela became fully independent in the 1830s, it is the anniversary of the 1811 Declaration of Independence that is observed as Independence Day. This day is also celebrated as Armed Forces Day. On July 5, the entire National Armed Forces of the Bolivarian Republic of Venezuela are honored. The holiday is marked with military parades, political speeches, concerts and other festivities.